I subscribe to a great blog called The French Genealogy Blog. Today their post is about The Beleaguered Nobility of Brittany. In short, it describes how Louis XIV wanted to establish who in his realm was truly of the nobility and who was not. Apparently, nobility did not pay many forms of taxes, which meant that there was obviously a financial incentive for many to become what were known as “false nobles”. This problem was particularly severe in Bretagne. I was unaware of this until now. Within the post, other links to very useful websites are provided which may or may not help you with your research into your Breton ancestors, but they are never-the-less all worth a look at. 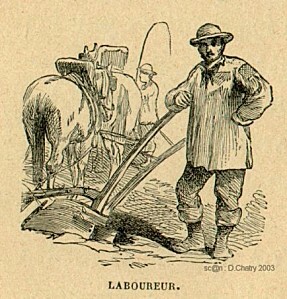 Agricultural Labourer – a person who tills the soil for a living. I have just looked into this for the first time all of which is very interesting as my family also originate in Henon starting with my great grand mother Marie Louise Rabet who came to the island with my grand father when he was about eight years old. Marie Louise later married Yve Le Moal at Trinity Church. I have rejoined the Family History Society and I hope later to find out if my Marie Louise Rabet had any brothers and sisters. On her marriage certificate it was stated her father was Pierre Rabet a farmer.